F. Winter, N. Hahn, H. Wierstorf, and S. Spors, “Azimuthal localisation in 2.5D near-field-compensated higher order ambisonics,” 2017. Additional Material and the Slides can be found here. Sound Field Synthesis approaches aim at the reconstruction of a desired sound field in a defined target region using a distribution of loudspeakers. Near-Field Compensated Higher Order Ambisonics (NFCHOA) is a prominent example of such techniques. In practical implementations different artifacts are introduced to the synthesized sound field: spatial aliasing is caused by the non-zero distance between the loudspeakers. 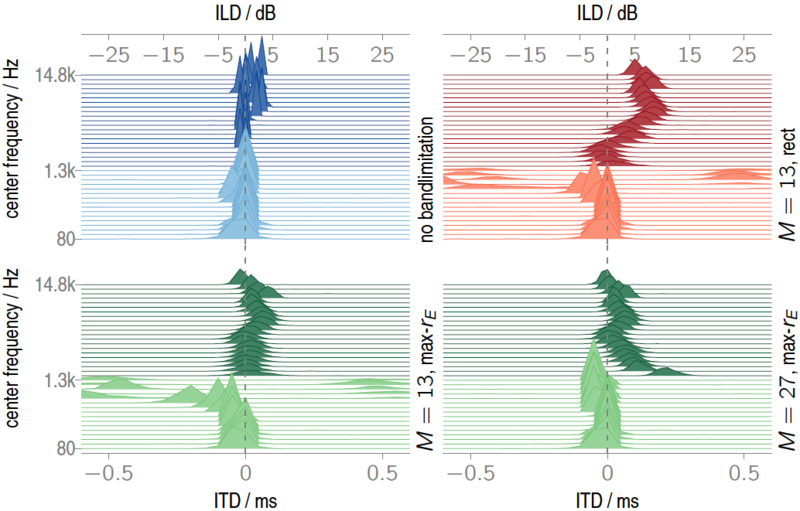 Modal bandwidth limitation is a well-established approach to reduce spatial aliasing in 2.5D NFCHOA, but introduces temporal and spectral impairments to the reproduced sound field which strongly depend on the relative position to the center of modal expansion. Also, the dimensionality mismatch in a 2.5D synthesis scenario results in a different amplitude decay compared to the desired sound field. Listening experiments already investigated the azimuthal localization in 2.5D NFCHOA. It is however unclear, in how far individual artifacts caused by spatial sampling, modal bandwidth limitation, and the 2.5D dimensionality mismatch contribute to these localization impairments in particular. Within this contribution a mathematical framework is used together with binaural synthesis to simulate the individual effect of each artifact on the ear signals. Humans’ performance is approximated by a binaural model for azimuthal localization. This entry was posted in Announcement, Publications, Talk. Bookmark the permalink.